English Village は前期７月２１日で終わりましたが、後期も開催しますので Please come! 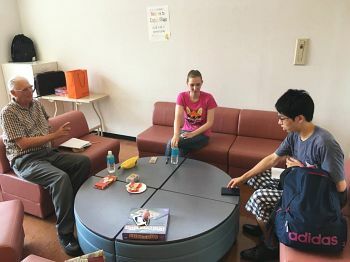 This term, we had many wonderful students join us! We enjoyed playing games and talking with them! We hope to see many of them again come next term. 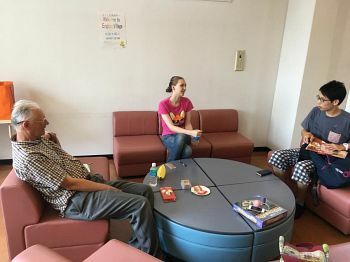 I am really looking forward to seeing how the homestay students’ English has improved. Also any questions they may have. Keep using your English! Thank you for joining us! Malaurie さんも後期皆さんとチャットするのを楽しみにしています。５分でも構いませ んので Please drop by! something, even: “I don’t have time, today.” It’s OK. Do your best for your exams, enjoy your summer and looking forward to talking with everyone in English from September. Try to come! Best wishes for a wonderful summer. See you in the fall!